Shipped across the country in Bankers boxes, this annual traveling exhibition presents a dozen distinct national and international showcases each year. Working with local correspondents, each box houses a collection of thoughtfully designed objects, reflecting the particular resources and makers of that area. Over 200 design studios and makers have been a part of ‘Outside the Box’ since its debut in 2015 in Toronto. Through this series, readers will have the chance to learn more about what we will be seeing at the 7th edition of the exhibition. Is this your first time being involved with the TO DO Festival? 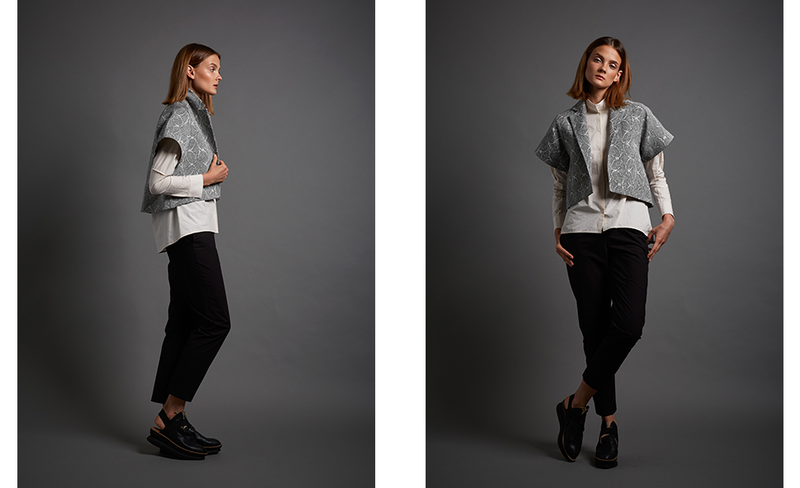 The Canprint Bolero is an easily wearable piece from our initial collection. RITE OF PASSAGE is a collection built to symbolize the elegance and sophistication of American made textiles and the meaningful role clothing holds in our individual archive. The intimate relationship our bodies have with the textiles that adorn us empower the garments we wear to reflect and affect our psyche and identity. Can you tell us about the work you will be showing at the Festival? Our sewing facility (Sew Co) shares a roof with The Oriole Mill. Beautiful fabric pours off the looms and inspires our three-dimensional designs. We work by allowing our instinct and intuition to lead us. Our practice is rooted in the practicality of construction, silhouette, and the moment. As a designer, what role do you feel TO DO plays in our art and design industry as a whole? Good design inspires good lives. TO DO brings an awareness that life can be happier, healthier, more celebrated through good design. Thank you. The project was created by the Toronto Design Offsite Festival, and is organized in partnership with WantedDesign.